Arlington Heights 715 East Rand Rd. This is an excellent place to have your vehicle diagnosed and repaired if you are in the Chicago area. These folks are honest, as we say at home, “Down to the bone.” They are one of the few, if not the only one that will not try to sell you something you don’t need, or make a big to do over something small in order to make a sale. Their work is good and sound. They are professional at all times. Let me say this: I am from the Central Georgia area. I come to the Chicago area to visit with family. On one of my earlier trips here I needed service on my vehicle. I used the Palatine area Casey’s. If I need something done with my vehicle when in the Chicago area, this location is where I go. I trust these people as much as I trust my personal mechanic at home. Very professional and fair prices. Great customer service plus free loaner car. I definitely highly recommend, as I will use them for future services. We have been customers here since 2003 and my husband always trusted their work and liked the people who work here. On December 18, 2003, I was driving and suddenly my tire light appeared. I was a few blocks from Casey Automotive. I pulled in at 5:55 p.m. (5 minutes before closing) only to realize that the front and rear driver side snow tires were both flat – the bead was cut and could not be repaired. Mike, the manager, knew I needed assistance and asked if I could go home and get my regular season tires and they would order me 2 new snow tires for the next day. My husband recently died and I couldn’t put them in the car myself. I told him my situation and said I had no one who could help me. He said, “Wait I have an idea” and he had one of his mechanics drive me to my home, put the other tires in his car, drive me back to Casey Auto and switched the tires. These guys are the best! They are professional and competent mechanics who are also compassionate! When I thanked them for staying later and helping me, Mike said, “If it were my Mom, I would want someone to help her!” This is more than a business – it is about people helping people! Casey is the best. I wouldn’t take my car anywhere else. These guys are the best. They explain things clearly, work with you however they need to get your car in, and their work is excellent. They will even offer you a loaner vehical if one is available. I give them as many stars that Customer Lobby allows! 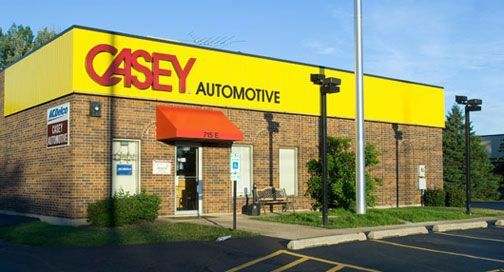 I have gone to Casey Automotive in Palatine, Ill for several years now and have found them to be honest and reliable and always given me outstanding service with all of my vehicles. I know if they say I need something done to my car, then it needs to be done. I have had my Motorwerks Honda dealership tell me a certain service was needed on my vehicle, I take it to Casey and they have told me that the service is not needed and explained why not. IF I did need service Casey’s price was always equal to or less than the dealership’s price. I would strongly recommend taking all your vehicles to Casey for your automotive needs. best over and over !!! I have been coming here for last 10-12 years with 3 different cars. As a business person my self, Pete and his staff our knowledgeable, fair and helpful and above all courteous, to take time to explain to me but, my wife also. Loaner cars on jobs that take longer than a day always. I will not go any where else They have the package! Service! !, Knowledge, and understand their clients needs!! Casey is the best. I wouldn’t take my car anywhere else. These guys are the best. They explain things clearly, work with you however they need to get your car in, and their work is excellent. They will even offer you a loaner vehical if one is available. I give them as many stars that Google allows! Have been going to the place for some time now and brought my car in today for an oil change. The place does a good job with a great prices so they were back up. I waited longer then I was expecting but my time was worth it!!! I can say they Casey Automotive is in the business to make the customer happy. Service is good and customer service is even better. I am completely satisfied with my experience with Casey today and will bring my vehicles back to that location. Thank you Pete for providing Quality service and Reliable results. I’m a regular customer. Diagnostic Testing was exceptionally well down in helping me pass emissions testing. Mike the technician was very competent and helpful in explaining results and options. Gerry G.
Excellent mechanics, and automotive knowledge. I’ve been going to these guys for car service and repairs since the 80’s. They do excellent work. I would highly recommend them to anyone! Casey Automotive was excellent! I have been using them for four to five years now. I took my car over to have a tire replaced recently. They did a good job. Plus, they let me know that the tire was still under Warranty, so they replaced it for me FREE of Charge. It was very easy to set up an appointment to go in. Casey Automotive is very reliable and I would definitely recommend them. Recommended Them For Nearly 30 Years! I have used Casey Automotive for nearly thirty years. I refer them to everyone! I even referred my two sons to use them. They recently installed four new tires and did an alignment on my vehicle. Everything turned out fantastic, as it always does. A while back, I took my car in when the Sensor went off showing a “Low Tire Pressure” warning. I thought it was the tires. But come to find out, it was actually the Sensor that was defective. Because Casey Automotive stands by their products, they replaced the defective Sensor at No Cost to me. They are so honest and care about their customers. At this time when caring is not a hallmark of service providers, Casey Automotive is at the height of it’s field. Their service shows that their Managers really care, which is rare. They are efficient and extremely professional. They offer very fair prices, too. I highly recommend them to everyone and have done so for all these years. I have used Casey Automotive several times. This last visit I had the oil changed and a tire rotation. Everything was great. The workers answered questions and even pointed out an issue that I should have looked into in the future. The service at Casey Automotive is great and I will continue to use their service! Hats off to Ivan,Oilie, and David. I’ve been taking my work trucks to Casey’s for the past 10 years and they go above and beyond my expectations. Thanks for the wonderful service and keep up the good work. We have been going to the palatine location for several years and will only take our vehicles to Casey automotive for any needed services. They have always been honest and accommodating and trustworthy. Always Take Very Good Care of Me and My Cars! I’ve been going to Casey Automotive for about fifteen years and they always take very good care of me and my cars. They always manage to provide me with a loaner car when I need one and that is very important to me. It has absolutely been a good experience with them. Their technicians are professional and communicative. Their pricing is good. It’s a very good value for the service that you get. Their customer service is also good and I’ve found them to be responsive. I’d recommend them to anyone for automotive work, but especially if you have a European vehicle. They offer maintenance and repairs for all kinds of vehicles but they are also professionally trained to work on European cars. Good customer service and knowledge! I take my Kia to Casey Automotive for everything (except for the occasional warranty recall when I go to the dealer)! I will definitely continue using them for general maintenance. They do my oil changes, tire service, brake service, etc. Casey Automotive is great and I highly recommend them to others! Very, very satisfied! Love the place! Can’t say enough good things about them! I go to the Streamwood location of Casey Automotive and I just love all those guys! Odie, Mike, even the guy who drives me home, all of them. Their work has been perfect for over 20 years. Repairs get done, they’re complete, problems are fixed. My kids go there now. I look forward to getting the oil changed on my Honda so I can say hi to all of those guys at Casey Automotive! They’re My Go-To for Car Issues! I have been going to Casey Automotive for many years. They do good work. Every time I go there, they’re very patient with me. I always have a lot of questions and they’re very accommodating of that, which I appreciate. They try to clarify everything the best they can and make me understand what’s going on. They’re also very clear on prices and they offer reasonable rates. Most recently I went there for an oil change. They pretty much take care of everything for me, from repair work to regular servicing and maintenance. They’re very friendly and polite. They’re also extremely knowledgeable. I go to them for anything related to my car and I will absolutely continue to use them. I started working with Casey Automotive back in the early 90’s. I did a survey of many auto companies around the area and by far Casey was the only one that gave thorough enough explanations. I have worked with them ever since and their work over the years has always been great. Their staff is professional and they are easy to get in touch with. I have always referred them to others and in some ways am lucky to have found them, as it was just by dumb luck. Never Had an Issue After They’ve Worked on Something! I have been going to Casey Automotive for about ten years now and they have always treated me fairly. Overall, I’ve had a good experience with them. Most recently they did a brake job for me. It’s working well now. I’ve never had an issue after they’ve worked on something. Their pricing is fairly good; I do negotiate and I use the coupons they give. The mechanics are very professional and competent. They are prompt and responsive in their customer service. There’s one guy at the counter who’s really good at what he does. I always appreciate how thorough he is. It’s just excellent service. I’ve been using Casey Automotive for twenty years and at least and I’m very happy with them. They are honest and professional. I like that they want to work with me and are accommodating. They give me different options so that I can find what suits me best. I go to them for both repair work and regular maintenance stuff for my car. Their prices are reasonable. The mechanics are very good with communication and they’re friendly. They’re knowledgeable in their field in the way I need them to be. Casey Automotive is an excellent place to take your car. I have been going there for over ten years and they have been very good to me. They are very competent and knowledgeable. Their mechanics are very good and they always pinpoint the problem. They don’t guess, oh, it’s this, oh, no, it’s the hose; they’re very precise and they know what they’re doing. The staff members are pleasant and polite. They communicate clearly with the customer. All I can tell them is: Keep up the honest and good work that you do! I Know They’ll Fix It! I have been going to Casey Automotive for at least twenty five years. They do good work. I go to them for both repair work as well as regular maintenance and servicing. Most recently they replaced a circuit board on my Buick. I’m very happy with them. They are polite and responsive whenever I get in touch. The technicians are communicative and keep me in the loop with what’s going on. I do think their pricing is a little high. Although it’s definitely better than a dealership and the quality of the work is very good. I know that when I bring my car here, it’s going to get fixed. I have been going to Casey Automotive for the regular for maintenance and servicing of my care for about the last five or six years. The staff is friendly and they do good work. They’re communicative and keep in the loop about what’s going on. Their pricing is good. I’ll continue to use their service. Casey Automotive is absolutely spectacular. They are wonderful in every way. They are professional, friendly, efficient, everything you could want. They’re perfect. Casey Automotive has always taken care of me. I use them because they are close, but also because they are great guys and they do great work. I like that they are very convenient and give me rides home when my car is in the shop. The mechanics are definitely knowledgeable and know what they are doing. The thing I love about them the most is that they are an honest business. In one instance, my car had a warranty on a part that was broken and they fixed it for me without charge. Another time, I took my car into the dealer to get something fixed and the dealer was going to replace two very expensive parts. I took it to Casey Automotive and they said that I only needed to get one of them replaced. They steered me away from a higher price. That experience gave me confidence that they would never sell me something that I did not need. I have never had any problems and will always be using Casey Automotive. Great speed of service, prices, and customer service! Make sure you get there at 715 if you want your oil change done quickly! I’ve always received very good service from Casey Automotive and I would definitely give them high ratings and be happy to recommend them to others. They’re knowledgeable, efficient, and have been extremely reliable. Most recently, I took my car in for a brake job. It was as well handled and pleasant an experience as ever and I really have no complaints at all. They’re great. I’ll certainly continue to return and I recommend you do, too! A blessing to have in our neighborhood! We all appreciate superb service and good and honest staff. You will get both here at Casey’s. My car is past its warranty and a certain service will cost me lot. I’m so thankful that they look into it and found out that the dealership actually extended the warranty for that service. They could have just turn a blind eye about it but no, they explained it to me and hand me a service paper to give to my dealership so I could have my car fixed for free. And that’s how they keep their doors open. That’s why customers keep coming back to them. Good and honest people plus superb service. They deserve more than 5 stars! I always have a great experience when I bring my car here. Everyone is very helpful, especially Dave Hudson. He is always quick to help and makes the whole process easy and stress free. I needed new brakes and could only make it in at 4:30pm and they were able to squeeze me in and get them done that night. Which was amazing since I have a little guy and they weren’t very safe to be driving on. I have never had a bad experience from oil changes to major repair. I’ll always come here for my cars needs. Thankyou! Friendly and professional. Waiting room is very clean. Prices are fair. No pressure tactics like dealers use to sell the “service of the month.” They will alert you to conditions that should be watched, which I appreciate. Just good honest folks. Wonderful Management! A Fantastic Company to Work With! Casey Automotive is an absolutely fantastic company to work with! I’ve been a loyal and very satisfied customer of theirs for over two decades, now, and I would absolutely recommend them to others. It’s a wonderful, family oriented business and they really go out of their way to help you and provide the best possible service. I and everyone in my family will definitely continue to work with them! Thank you, Casey Automotive! Tired of paying 65.00 for a full synthetic oil change? Go to Casey. I received a mailer for an oil change for Casey. I received 2 other mailers for other places. After having gone to both other locations and walking out because it was a bait and switch with no fine print on the mailers and double the advertised price – I was not expectng much more from Casey when I walked in. To my surprise, they were gonig to charge me EXACTLY what the mailer said for the service that I needed. Half of what the other two previous places were going to do it for. Mike was great. He didn’t try to upsell me anything and he was extremely personable and helpful. I won’t be taking my car for service, anywhere else. Casey Automotive is an absolutely terrific company to work with! They’re incredibly honest and wonderfully accommodating. I use them for absolutely everything and really couldn’t possibly be more pleased with their professionalism, integrity, and high level of customer service. They pick me up and drop me off, and when my car leaked oil on my garage floor, after they’d worked on it, they came right out to fix and clean it. They’re thoughtful, responsible, and very kind and communicative. Thank you, Casey Automotive! Excellent service, always! I’ve been using Casey Automotive for about ten years. I own a company, and I bring a lot of trucks in for maintenance and repairs. This last time, they did a brake job on one of my trucks, and it turned out pretty good. I’m pretty happy with them. It’s a company I can trust. They are pretty fair. I recommend them to all my friends when they need a mechanic they can trust. They are truthful about whats wrong with the car. I call, and they always handle whatever problem I call in. I’ve been working with Casey Automotive for a while, now. Most recently, I hired them just for an oil change, and I will definitely be continuing to hire them, in the future, because I’m very happy with their service. They are a very reliable, honest company, and I’ve always been entirely satisfied with their work. They communicate and explain things quite well, and I appreciate how uncomplicated and efficient it is to work with them. Thank you, Casey Automotive! Great honest service reasonably priced I will continue to be your customer for life . Thank you all for your hard work ! Great experience fixing my truck in a timely manner. Saved me good amount of money and the guarantee now for parts and labor is outstanding. every thing went well and clean!!! I would suggest everyone use Casey Auto for all your auto needs and Tires also!! I have been using Casey Automotive for about eleven or twelve years. They have done everything from changing tires, repairing flat tires, rotating tires, replacing valve stems in tires, windshield replacement, radiator replacement, and so many different things, I couldn’t even list it all. If I have a problem with my car, I go Casey’s. They are my first choice every single time. Their customer service is excellent, and I definitely recommend them! Honest. Reliable. Over and above. I am a full believer in my auto dealers repair shop with the Starbucks coffee… UNTIL NOW! I have been helped, learned about my truck, and treated with dignity at Casey Palatine. I’m now signed up with Car Fax for free through Casey and have more control over when/why I get service. If you are someone who doesn’t know a lot about cars/trucks, but want to be a good steward of your vehicle, I highly recommend Casey in Palatine. I have been using Casey Automotive for more than fifteen years now. They have worked on at least ten different vehicles for me. I have nothing but high remarks for these people. It is easy to schedule an appointment. They don’t rip you off. I wouldn’t go anywhere else. I would even take my car to Casey Automotive before I would take it to a dealership. What’s really good now is that they have a 24 month warranty on parts and labor. It’s nice to know that if you have to go back, and it’s one of the parts they worked on, they’ll fix it. A Company with Integrity. Honest and Communicative. Very High Ratings! I take both of my vehicles to Casey Automotive for absolutely everything and I couldn’t possibly be any more pleased with the work there because they’re all magnificent. I’m no car expert, myself, and it is a great relief to have found an honest, trustworthy company that communicates well with me about the cars. They’re reliable, thorough, and have always communicated well and kept their word. They’re organized and very professional and I’d definitely encourage others to go there, as well. Very high ratings for very high-quality service! The only reason I will not be continuing to go to Caseys is that I have moved out of the Arlington Heights area. Caseys was honest, respectful, did not talk down and was most helpful and patient, especially in helping me to eventually get the dealership to replace my leaking transmission, even taking pictures of the leak for me and talking to the dealership. I only hope I can find mechanics like that in my new place of residence. I appreciate the pleasant experience in dealing with Caseys. U.N.
Every time we have gone to get work done they have always been up front about what needs to get done or what can wait. Service has been perfect and the guys up front are always in good spirits. Keep doing what you guys are doing. Thank you so very much to the crew in Arlington Heights for the timeliness, courteousness and professionalism shown to me yesterday regarding my van. A shout out to David for the personal assist relating to additional vehicle matters/maintenance. I will be back! My experience with Casey Automotive was excellent from start to finish. I have been able to do business with the company for about four years. I would describe the employees as professional and easy to work with. They were able to replace the necessary parts for my vehicle and I was happy with how the work turned out. I had no problems setting up the work and it was completed within an appropriate time frame. I would continue to work with them in the future. Excellent Service! Good with People; Great with Cars! I definitely had a very good experience at Casey Automotive when I went most recently to have my breaks worked on. They’re wonderful there, really, and I’ve never had any problems at all. They have excellent customer service and they’ve always been very reliable and easy to communicate and work with. I appreciate how consistent they are and would have no problem recommending them to others because I’ve been consistently entirely satisfied. Thank you, Casey Automotive! My experience with Casey Automotive was five out of five stars and I would definitely recommend their service to other people. I have used them in the past, but I recently worked with the company to do work on the head gasket of my vehicle. The company offered a considerably less expensive service for this operation and they completed the job beautifully. The technician was great to work with and extremely professional. I would gladly continue to use them in the future. I appreciate how knowledgeable he was and that he gave me the straight facts. We’ve been going to Casey Automotive for ten years and it’s always been great. Most recently they fixed my Altima. I had to get the car fixed for my daughter, and so they did a top-to-bottom and put it in working order for her to take over. It was all in good working order when they finished, and they were honest and reasonable about the price. Everything was done on time. I took my car to Casey Automotive most recently for an oil change and a tire rotation. I’ve been a customer there for ten years or more and they’ve been pretty consistent in their quality of service. The pricing is very fair and it’s a very convenient location for me. I like to leave my car there, walk to the gym, and then walk back to pick it up. I bring my cars here exclusively for repairs. I usually deal with Gabe and he is good at explaining what work needs to be done and why. He works with me on price by giving available discounts that I am not always aware of. I feel that they are trustworthy and I don’t feel ripped off after I’ve been there, unlike other mechanics I have dealt with in the past. I have had nothing but good experiences at this Casey Automotive Center for years. Most recently I had my Suzuki towed to their services center after hours and the worked very hard to find the issue. Gabe the service manager was so kind to me when having to break the bad news that my engine was shot. Despite the outcome I felt so well taken care of; that kind of personal attention and kindness is rare in the automotive industry. A great place to take your car! I’ve been taking my cars to Casey Automotive for years. They are knowledgeable, figure out the solutions to your issues and advise you along the way on what needs to be done. I trust them to make a good recommendation and they are also friendly in the process. A great place to take your car for service! Casey Auto motive is second to none. I’ve had many experiences with them and all have turned out well. They are friendly, customer focused, efficient and reasonable. They get back to you quickly and do excellent work. Recently I had my car in an accident where I was hit on the front of the side and my radiator fluid leaked out and resulted in a blown gasket. Casey automotive New exactly what was wrong and diagnosed the problem correctly. Due to an error by my insurance company, my car was taken to Arlington Heights Ford for repair instead. In the end, I had to take it back to Casey and they did my repair. Could not recommend them more highly! Every time I come here I leave happy. There prices are great and they are honest. Never try to over sell anything that is not necessary. My experience was excellent. They were so professional and trustworthy. It’s nice to have confidence in a car repair shop and reliable work done. I purchased an older vehicle less than a week ago, unfortunately, my car died at an intersection 2 days after buying it. I found myself needing a good, honest mechanic. I can honestly say from the moment I walked in, to the moment I left, I was treated with respect and the staff was extremely friendly. 1st diagnostic inspection didn’t show anything, so they had to dig deeper. Once they determined what needed to be done, I was informed and updated on everything. I did need some suspension work, which ended up being more expensive than I planned for, but they have reasonable pricing! They weren’t pushy, but were upfront and honest with what needed to be done. I worked with Ivan and he was really great. I feel like I have a place I can call/visit anytime to meet my vehicle needs. They have a customer for life 🙂 Thank you Ivan! I’m providing this review even though I don’t have my car serviced at Casey Automotive. My car’s VIN # got recorded to another vehicle by mistake. So my service had been incorrectly reported to CARFAX. While Casey Automotive had nothing to do with this mixup, they devoted a considerable amount of attention and follow up to effectively address this issue. I would wholeheartedly recommend Casey Automotive to anyone who values top notch professional auto service. Car had some major problems with the suspension. They checked car during my oil change and notice 2 major problems. I asked if I could safely drive my car after their diagnosis. They said with caution which gave me time to collect extra funds and prepare my personal schedule. Eventhough I still had the oil change done, Casey’s whom I worked with for 25+ years, went ahead and gave me the time to arrange the up and coming repair. I called when I was ready and they fixed the car during an agreed upon schedule. Excellent service by Ole and Mike and rest of the staff. Best car repair and service in Palatine. Have used them for years and you can expect honest professional services every time. The employees at Casey Automotive have done a lot of work for me and I would recommend their service to others. I have used this company to do service work for my cars (including engine work, replacing an engine, oil changes, and more). The workers are really good at their job and they are able to get back to me quickly. I have been using them for about three or four years. I would be happy to work with them in the future. I have been using Casey Automotive for about a year now and I have been very pleased with the service that the company provides. I think that I would continue to use them for future work. I have been using Casey Automotive for automotive repair and the staff does a great job. I think that they are very professional and just friendly. I would recommend their service to other potential customers. Casey Automotive has done just about everything for my car. I’ve been taking it there for years now and that’s the only place I go. They’ve done all different kinds of work from oil changes to major repairs. Most recently they did work on my battery and alternator. I’m satisfied with the pricing and I intend to stay with them. I trust them. They’re always honest with me and they do good work. The one or two times thing had to be redone for some reason they did it immediately and free of charge. I don’t trust any auto shops more than these guys! Reliable, fast friendly service from honest folk. Recommend!! Casey Automotive is a place where the security of your car is guaranteed. Arrived yesterday morning before doors opened. There were 4 in front of me. Doors opened promptly. Full staff ready and waiting to help. Polite and pleasant! Out in lass than 5 minutes. My car is old and needed a lot of work. Dennis called me and gave me a full description and breakdown of what was needed. I ended up taking the car somewhere else as a family member was able to get me a break. I explained this to Dennis when I went to get the car and understood. Highly recommend this place for overall customer satisfaction. They are efficient, knowledgeable, and great to deal with! Casey’s is the place to service your vehicles. Have been a loyal Casey’s customer for a long time. I trust them, they do a great job and they stand behind their work! I respect and trust my Casey. Gabe, and the whole crew, are very polite and educated. I feel respected and appreciated when there. Arlington Heights Casey is a well-oiled machine. Always excellent service at a reasonable price. Thanks for your help over the last 11 years. Wow. Exceptional Service &Exceptional Team. I’ve gone to my KIA dealership in Naperville for 2years, and recieved less than average service from people who didn’t care (Dave the service manager) and charged me 3x more than Casey. I come here to Casey in Streamwood, and they took care of me each time like I was family and like it was thier own car they were working on. They went ABOVE &BEYOND! Most people just do the bare minimun as long as they’re getting paid, but not with this team of men. It’s rare to see this kind of team, and I say team because I recieved exceptional service from everyone that has helped me there (up front and the guys in the back), not just one person. If every business had guys like these, America sure as heck would be a better place. Thanks Casey of Streamwood, you guys really are the best and I appreciate you all. Great guys, honest, friendly and helpful. This will be my go to automotive service after this positive experience. Thanks for your honesty vs. the dealership honesty. I appreciate you guys letting me know the truth of the work I need done and not just trying to make an extra chunk of money today! Thanks Gabe and team, cya next time I need something done! Casey Automotive is great and I would definitely recommend them. I went to another dealer first and quoted me a price of $2000 plus for the repair work. I went to Casey Automotive and they did the work for about $800. The technicians were great. Their customer service is absolutely wonderful. Everything’s been working fine since then. I was happy enough with their service that I recently recommended them to my sister. Mike at Casey’s could not have been more friendly and customer service oriented. I had some issues with wheel bearings and he was able to beat other shops by hundreds of dollars while putting me at ease through the entire process. Will definitely be recommending them to others in the area! A well run operation! I’m a regular customer and will remain so! Casey Automotive has a professional and polite staff. When it came to diagnosing the problem with my rear brakes they did not take advantage of the situation and tell me I need calipers when I thought for sure they were not working because of the rust on the rotors. Turns out the brackets and pins were frozen on the calipers. Yes I needed rotors, I new that from the passenger rear grinding noise. It was great that they gave me 2 options to correct the problem. 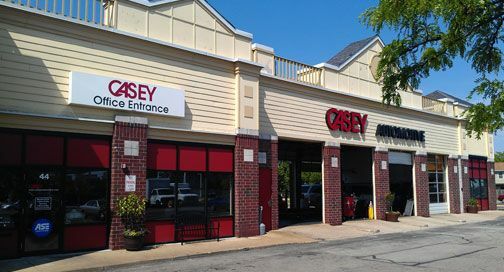 Take your vehicle to Casey Automotive, they won’t do unnecessary work to empty your wallet like other places might. Great job Casey Automotive! Another great experience at Casey Auto. My vehicle was pulling to the left so I called them about an alignment and he said get your new tires first (front) then bring it in. So I got the front tires (needed bad) put on and the pulling to the left was gone, but I didn’t want to take that chance that their was nothing wrong with my alignment. They took it in back and made a some minor adjustments, gave me my keys and said have a good day. They really know how to treat customers. Those 5 stars are accurate! I’ve been a loyal customer for years. I only take my cars to Casey’s. No one else touches them. They are always thorough, conscientious, and honest about any repairs or maintenance my vehicles need. I tend to want to “over care” for my cars, and they will tell me when I’m wanting them to do something that isn’t needed. You really can’t ask for better service than that. My husband took his car first time here and had the best experience and staff were really friendly and price and work was amazing. Thank you for your hard work. Very reliable and trustworthy! I have complete trust in them. They have never tried and sell me service I don’t need. Trust in the work they do. Completely satisfied. I take my cars there all the time. They have great prices on oil changes with free tire rotation. Can get loaner vehicle if more involved work needs to be done. Always find they do a good job, stand behind their work, and have fair prices. In the past I have always taken my car to a dealership, as of now Casey Automotive will be my only choice for repairs and maintenance due to their pricing, workmanship and customer service. I’ve been taking our vehicles to Casey’s ( Palatine ) for the past 5 years or so . Pete, Jesse and the rest of staff have consistently provided excellent, knowledgeable service and I’ve never had any issues with any of the work they’ve done . They’ve saved me thousands of dollars on the ridiculous quotes provided to me by local car dealerships . The best part about Casey ( shout out to Pete in particular) is that they have never tried to sell me anything I actually didn’t need. I’ve recommended Casey to friends and associates many times and will continue to do so . Why? Because they are simply the best . Casey Automotive always provides great service to me. I have been going here for years now to have all of my cars serviced. I first came to Casey Automotive via my Dad’s recommendation. I had some structural repairs and break work done. Later I returned due to an issue related to the original repairs. It came to pass that they went above and beyond what I could of imagined to correct the issue and even correct non-related issues they didn’t have to. I remember thinking “you don’t have to do that” yet they did! I had a 14 year old car that was barely functional yet they put in all this extra time/labor/etc to fix a list of various items (thermastat issue, key ignition issue…the list goes on) and make the car much more functional. I feel this experience here says a lot about the quality of the “Value System” of the people at Casey Automotive. I respect them going HIGH above what would be reasonably expected here and making a significant difference for me on my end. Thank you to Mike and everyone else involved in making this happen. In a way, I feel speechless. Been taking my vehicles to Casey’s for two years now. They have been honest and fair to me with repairs and prices. They do not take appointments, so first come first served. I had my Maxima towed to Casey because it wouldn’t start. Mike diagnosed the issue which was related to a recall I was unaware of. Mike didn’t charge me for any time diagnosing the issue. The car was then towed to Nissan for the repair. Thanks Mike, I’ll be doing business with you in the future. This is my place for automotive works. They recently changed my oil and I’m happy with the whole experience. Love to have Casey’s as our neighbor! Always dependable, offer good, honest estimates and good ideas on how to do big jobs without causing the bank to break. Great local shop. Always fix it right the first time. The best place around with A+++ service! We have been long time customers of Casey’s for close to 10 years and have always brought our vehicles in for repairs when needing something done. Even after moving further away, we STILL will make the drive to get them checked and looked at because that’s how much we appreciate their overall service, the best team in town, and they will never gouge you on prices! If it needs fixed they’ll tell you, and if it doesn’t then they won’t. The good old saying goes, “if ain’t broke, don’t fix it.” That’s how I feel they work. They will always look for what needs to actually be done work wise, and that’s it. I’ve always appreciated the years working with Ole, Mike, and all the guys who bust their hump to make sure whatever the problem is, and that it gets fixed and you’re back on the road driving safely again. My hats off to you gents and all you do. Thanks for the many years of great service and looking forward to many more ahead (when it’s needed). Honestly their service deserves the 5 stars. My car kept failing the emissions test so I brought it back in. They somehow got the computer to reset, took it in and emissions tested it for me, all for no additional charge! They stand by their guarantee and I will absolutely be coming back. Great work and very honest! Have been to Casey’s a few times for work. Never felt pressured to do unnecessary repairs. Easy to work with and would recommend to others! We have been going to Casey’s for 13 year now and have never had a bad experience. Ole and the crew up front are always prompt and straight forward about issues with the vehicles that we have taken in. Would never go to another place while I own a car. I initially did not have a great experience here, but I had some great follow up after the situation, and the owner did everything right to correct the situation. I have to say the follow up and professionalism has been astounding, and I will be visiting this location for my next service . A Trustworthy, Personable Company! Absolutely Recommended! I’ve been using Casey Automotive for a while, now, and will definitely be continuing to return! Really, it’s an amazing company. Not only are they clearly competent, but they’re extremely personable (they know my name) and go above and beyond (being friendly and kind to my child, making conversation while I was away) to offer truly spectacular service. It’s simple and easy to schedule appointments with them and I’ve always felt entirely comfortable and well communicated with, when I’m there.They take good care of cars and good care of people, and I’d definitely recommend them. I trust Casey’s implicitly with maintenence and repair of all of our cars. It’s the best oil change in town and they have caught several issues that would have left me stranded at the side the road. Thank you for convincing me to get new tires on my car. In less than a week, we had snow, and while others were slipping and sliding, my tires gripped the road. Casey Automotive is a trustworthy business with friendly employees. I have been a customer for over 20 years. As we watch both products and services rapidly deteriorate, I am more than happy that Casey remains a local stalwart. It’s not just the service, it’s also the relationships they make and maintain. They have serviced my automobiles for 30 years, never had an issue. Recently, my Subaru went in for new brakes, outstanding result, as usual. But, what was so memorable was that I needed a new wheel bearing, which wasn’t detected when I was in the week before. Not only did Pete waive the labor cost of that service, they completed that add-on work within a couple hours. That simple act cements my relationship even further – Pete, their Manager, is just outstanding. They justly deserve the accolades. Gabe and all the mechanics at Casey’s are not just great at what they do, but they’re also very kind, efficient and trustworthy. We’ve always been extremely happy with the service and care we’ve received there and recommend them to our friends and family. My husband and I have moved out of town but our daughter is still there in Arlington Heights and it feels GREAT knowing she’s in good hands with the wonderful team at Casey’s!!! I can not believe that not a 1/2 hour had gone by since my complaint and Mike (owner of all 3 Casey Automotive’s) was on the phone with me apologizing for the confusion that occurred. That usually doesn’t happen in today’s world. A simple phone call has changed my opinion. I know my few oil changes a year would not shut down Casey Automotive if I stopped using them, and the fact that Mike would care about a small customer shows me what kind of business Mike and his family run. I guess it’s time for me to apologize. I’ll be there with Christmas cookies next week!!! I’ve been taking 3 of my vehicles to Casey Automotive for maintenance and repairs for a couple years now and have been very satisfied with the customer service they provide. I have had a lot of experience working with cars in the past so I can tell these guys know what they are doing. The manager Steve is always on top of things and I know I can give them a call if I have any issues. Their pricing is reasonable, especially for the high quality of work. They keep us frequently updated whenever any work is being done and let us know by phone when we can pick up our vehicle. We will continue to use their services and would highly recommend them to others as well. I have been a customer at Casey’s Auto for about 4 years. I’ am very happy with the service and honesty of the experience mechanics , Pete and Jesse. I would recommend Casey to all my friends and family. We have been coming to Casey for more years than I can remember! Always great work, great group of guys, great service. I’ve given them A LOT of money, but well worth it. Can’t say enough. Thanks Casey Automotive!! On behalf of the Village Board of Trustees I would like to thank you for your generous contribution to the 2017 Streamwood Holiday Helping program. With the help of your contribution, we plan to assist over 30 families. Thank you for your generosity and support of our community endeavors. Our best wishes to you and your family for good health and happiness during this holiday season and throughout the New Year! I have had only great experiences here so far, the staff have all been very friendly and knowledgeable. Recently got new tires and a new battery which were both reasonably priced and the fact that they offer drop off and pick up service while working on the car makes the fact that the wait can be fairly long worth the while. I am very grateful to have found this shop and would highly recommend it based on my experience. I have been using Casey Automotive since 2010 and I always have a pleasant experience with them. I used them again about a month ago to replace a water pump in my car. Everything is now working great so I am happy. The employees I have met are like family, they are just great. I absolutely will use them again in the future and recommend them to others. Really thankful for a place I can trust. My entire family brings their cars here & had great experiences each time. I don’t feel pressured to fix everything on my car or lied to about additional issues that are wrong. Gabe does a wonderful job with customer service and communication. Thank you guys! We have been a customer of Casey Automotive for seven years. They are always honest in their dealings and stand behind their work, which by the way has been excellent, and helpful with advice regarding any future service that maybe be around the corner. The folks at Casey Automotive are very nice people who do quality work at a reasonable priced. Whatever they do, they do it right. I’m a long time customer and I keep going back because I know that when they fix something, I won’t have to screw around with it. They’ll give me a loaner if I need one or they’ll give me a ride, which is awesome. They’re just really, really good. I will absolutely use their service again. Our whole family takes our cars here. Gabe is great to work with! He put in the extra time to make sure my car was running and helped me out a ton. I highly recommend these guys. They do quality work and make sure you understand what’s going on with your car. It’s great to be able to trust someone with your car and find great management and mechanics. I have been going to Casey Automotive for many years. I go to them because of their quality of services and because they are customer oriented. They always greet me by name and keep in touch with me regularly. They call me back and gives me quotes and keep me updated on my car while it’s with them. Their pricing is very good, it is easy to get in contact with them, their repairmen are professional and nice, and I ‘ve never had issues. They are a great company. I usually don’t leave reviews but I feel like these guys deserve it. I drive all the way from to city to this shop because I trust them 100% with my car. I can always count on the manager, Gabe, to give me an explanation of what’s wrong with my car and not feel like I’m being taken advantage of. Trusteorthy and Excellent service! I will continue to come here and recommend this shop. I have been going here for a very long time. I have had nothing but Great experiences from this facility. All of the staff here do an outstanding job. 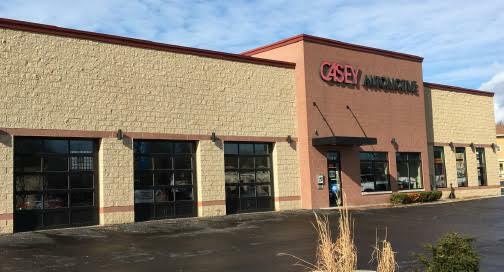 I highly recommend Casey Automotive – Streamwood to all my friends and family. You talk and they listen. Was in search for a automotive place that met my needs. Not only have I found it, they went above and beyond my expectations. Excellent service, told me what I needed and brought me into the shop and helped me understand what was the problems. Friendly, trust worthy and fair pricing are the reason I’ll be a customer for life. Bravo Casey automotive I’ll be telling everyone where they should be taking their car. I’ve been using Casey’s since I moved to Palatine…20+ years! Never had I had a bad experience here. And I own 4 cars! Friendly service and great explanations of repairs required. Thumbs up to Pete, Jessie and the whole team!! Casey Automotive has been servicing my vehicles for the last 15 years and I trust them, and I would definitely recommend them. I really haven’t had any issues because they’ve always been prompt, telling me exactly what I need to do to the car, and what is due. Their prices for oil changes are the best. I haven’t found any cheaper oil changes because their prices are very competitive. And I haven’t had any issues with the services they have recommended on my vehicles. I brought my older Acura TL to them for a simple oil change about 4 or 5 weeks ago, and it was great. Gabe got me in and out within a half hour. I’ve always worked with Gabe–and he has always been easy to work with because he generally tells you exactly what’s wrong with the vehicle. There are never any surprises. What needs to be fixed is always what they say needs to be fixed. Casey Automotive has done a lot of stuff for us. They take care of everything we need for our two vehicles. We bring them in all the time. We’ve had brakes done with them and numerous other things. Within the last month or so we’ve had an oil change and are planning on taking it back into them again soon to fix a minor problem. Their prices are comparable to others, so that’s fine. We have been with them for years and we feel real confident in them. Excellent Service! Been With Them For Years! I have been using Casey Automotive for many years now and they have always delivered excellent and consistent work. The service my vehicle and are able to fix any problems that I might have. I fully trust them – the staff is professional, friendly, and they always do what they need to so that I can get the results that I am looking for. They call me by my first name and they work well with my family, so they’re very personable. The pricing doesn’t even matter to me because they get the job done without question. I would definitely recommend them to other customers. I am happy with the great work that they offer. Casey Automotive is a solid shop and has great quality mechanics. I have been using them for years and it’s great to see the same guys working there every time I come in. I like that there is no turnover and they treat the mechanics well. They are also very knowledgable so I know they can get the job done no matter how challenging it is. They also charge a fair price for the work. I will continue to use them for many years to come and highly recommend Casey Automotive. I had a great experience working with Casey Automotive. I have absolutely no complaints with their service and they were able to help me satisfy my car needs. The staff was excellent and easy to work with and I was okay with the pricing. Overall, I’m happy that I got the results that I needed and I would absolutely recommend them to other people. They get top marks all around and they left me a satisfied customer, so I’m happy! Thanks for everything! The automotive engineers & technicians at Casey did me yet another SOLID favor this week–bringing to my attention minor electrical component failures which led to other problems. They pointed out how one piece (electrical relay on my Buick) was impacting another and leading to weird, intermittent behavior. The happy ending for me is that with Casey’s long experience in fixing a wide range of vehicles–from a whole lot of different manufacturers–they were able to recognize a part failure that can go bad on GM’s of a certain age. Thank goodness for their skill & training –they quickly diagnosed then rectified the problem–so I can continue (blissfully) down the road! Thanks CASEY!! Exceptional service!!!! Dependable, expertise in industry, trustworthy, efficient, & overall fantastic customer service. I’ve been a customer for close to 10 years. They have always had outstanding service, problem solved, & repaired multiple issues with my Dodge Journey. Affordable & again…trustworthy! A huge thank you to Gabe and entire staff at Arlington’s Casey Auto. Overall, I’m very pleased with the work and good communication. I work on cars myself and know that I’m not being taken advantage of because they are honest, so I trust them with my car. They do everything at Casey Automotive, including oil changes, suspension work, tire replacements, and engine work–and I’ve been dealing with them for the past 10 to 15 years at the Streamwood location. They are friendly with great service and good communication. Actually, I just brought my car in today–a Mazda6 with about 140,000 miles–and they recommended that I should buy another car rather than putting money towards more and more repairs. They told me the money I’m going to spend might as well be put toward a down payment because it’s too hard to tell if the car would last a couple of months or a couple of years after various repairs. I think they are honest and highly recommend them. They are a good bunch of guys at Casey Automotive. Highly Recommend! Peace of Mind! I had a great experience with Casey Automotive. I use them because they do a continual monitor of all my vehicles, charge maintenance and they also give me an honest preventative outlook on your cars. They help manage my cars and take care of them whenever I have a problem. I know that when I use their service there are no bad surprises. I have been with them for about 5-6 years. The staff has always been friendly and professional, and they always make room for me. Whenever I am looking for a car change, they are right there and ready to help with a review. The pricing is a little bit higher, but it is definitely worth it. i will keep using them in the future and I would definitely recommend them to future customers. The desk staff is fantastic and I know that I can trust them. It is easy to set up appointments with the company and they always give me peace of mind! After searching for years to find a reliable, trustworthy mechanic for our Hondas, we found exactly that several years ago at the Arlington Heights location. They’ve handled everything from basic oil changes to blown tires with courteous customer service, always going the extra mile and never trying to add any unnecessary services or charges. It’s truly a good feeling to have a mechanic I know I can trust. An extra star for Gabe the manager, consistently friendly & helpful. Updated 8/30/2017: another five stars just for Gabe please! After several issues with my hatch not closing properly and latching properly on my 2016 CRV, I brought it to him and he literally fixed it in 30 seconds. No charge. Great man. Great company. 500 stars! Our family has been coming here with all of our cars for several years. The service is above and beyond. They explain everything that’s going on with your car, what service you’ll need in the future, etc. Gabe is always so helpful and goes out of his way to take care of our family vehicles. We would highly recommend Casey’s to everyone! I found the combination of repair work, customer service, and pricing to be outstanding. Casey’s is very concerned about providing reliable, economical repairs. The loaner vehicle was a real plus and was outstanding. I have never taken my car to a better shop than Casey’s. I often tell people I know about how good the service has been and how this company tries to help the customer to save money. The service is such that I no longer need to go to the dealer. Thank You. Love Casey’s! Been coming here for years. They always do a great job and are totally honest about whT needs to get fixed right away and what can wait. These guys are honest and treated me and everyone I have referred to them respectfully and fairly. They do excellent work and are competitively priced. It is nice to have a Auto repair business you can count on. I have had several vehicles in for service over the years and they are Always repaired within the quoted costs and fixed first time every time, usually in less than 1 day. I take my cars to Casey Automotive when ever a repair is needed. Gabe and the staff there a are courteous and help explain what is needed and why. They offer a courtesy car or a ride if the repair needs extra time to complete. I feel their pricing is fair and competitive. My sister recommended Casey Automotive and she was right. I can not say enough about what great service I received at Casey Automotive- Gabe is so nice explains everything and their prices are reasonable. They are quick and accurate on the mechanic side and their customer service is also top notch. I recommend Casey Automotive to anyone who needs a oil change to major car over haul. My car suffered damage during heavy storms in our area. Through my insurance company, it was towed to Casey for evaluation. Casey did the evaluation quickly and completely and contacted me with the information. I found them very easy to deal with and found I was treated with intelligence and dignity. They do a wonderful job. I take my car to them every six months for an oil change, and I always have a pleasant experience. My husband and son take their cars to Casey as well! The last time I went in for an oil change, they informed me that my rear tires were balding, so I got four new tires and a new wheel axle. What I really like about Casey is how helpful and honest they are. Most places will charge you for a tire rotation, but Casey will do them for free if you request that service. They also keep my information in their computer system and will inform me if it’s time for services like having my tires rotated. Their prices are very reasonable as well. I went to another shop near me, and their prices were much higher than Casey’s. I’m happy to continue going to Casey! I have been using Casey Automotive for quite some time now and they usually provide me with top notch service. The only issue I have with them is that they are so busy all the time, I can’t really use that as a negative point on my rating though, I guess they just provide such good service everyone wants to use them! They are good guys, I will be using them in the future if anything comes up. I have also recommended them to multiple people already.